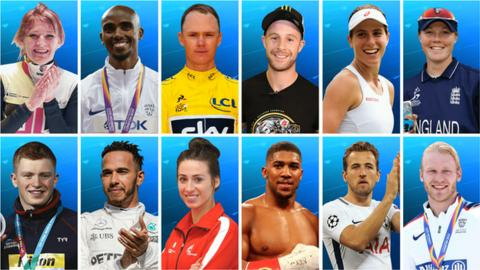 Here is a rundown of the 12 contenders who have been shortlisted for the BBC Sports Personality of the Year 2017 award, to be presented on Sunday. You can vote for your favourite by phone or online on the night during the live show from Liverpool. Recovered from a difficult 2014 Winter Olympics to become triple world champion. Christie took the 1,000m, 1500m and overall titles at the World Short Track Speed Skating Championships in Rotterdam, and won bronze in the 3,000m. The Scot - named Sunday Times Sportswoman of the Year - also won a World Cup event in South Korea as she bounced back from being penalised in all three of her events at Sochi 2014. What she said: "I thought about quitting a few times and I wanted to change sports. I just cannot believe I turned it all around." Sports Personality record: First nomination. Figure skaters have won three times - John Curry (1976), Robin Cousins (1980), and Jayne Torvill and Christopher Dean (1984). Stormed to his third consecutive world 10,000m gold despite almost falling twice late in the race in London in August. Also won 5,000m silver at the worlds, missing out on a fifth major championships distance double in a row. Won the final track race of his career - over the same distance at a Diamond League event in Zurich - and will now concentrate on road races. What he said: "It's been a long journey but it's been incredible." Sports Personality record: 4th, 2016; 7th, 2015; 4th, 2013; 4th, 2012; 3rd, 2011. Of the 17 athletics winners, Paula Radcliffe was the last long-distance runner to triumph, in 2002. Claimed a fourth Tour de France title and became the first Briton to triumph in the Vuelta a Espana. Froome was just the third rider to win the Tour-Vuelta double in the same year, and the first to do so since the Spanish race was switched to follow the French one in 1995. The Kenyan-born Team Sky rider also won two bronze medals at the World Championships in September - in the individual and team time trials. What he said: "To win two Grand Tours like this is an amazing feeling and it's going to be hard to top." Sports Personality record: 6th, 2015; 6th, 2013. Between 2008 and 2012, cycling had three of the five annual award winners. Clinched his fourth world title at the Mexican Grand Prix in October despite finishing only ninth after a clash with rival Sebastian Vettel. Hamilton, who is from Hertfordshire, also broke Schumacher's record of 68 career pole positions and now has 72. What he said: "I can't believe that I've got four [titles]. You've just got to enjoy the ones you have." Defeated Wladimir Klitschko with an 11th-round stoppage in a gripping fight watched by a post-war record crowd of 90,000 fans at Wembley Stadium in April. The Watford-born fighter defended his WBA and IBF world heavyweight titles with a dogged win over Carlos Takam in Cardiff in October. He took victory in the 10th round despite suffering a broken nose in an accidental clash of heads in the second round. What he said: "I'm serious about becoming undisputed heavyweight champion of the world." Sports Personality record: First nomination. Joe Calzaghe was the last boxer to win the award in 2007. Tyson Fury was fourth two years ago. Finished the Premier League's top scorer for the second successive season, winning the Golden Boot again with 29 goals. The Tottenham striker scored six hat-tricks in 2017 and was also the only English player to be shortlisted for the Ballon d'Or prize. Kane netted a crucial equaliser against Scotland as he captained England for the first time, and sealed qualification for the 2018 World Cup in Russia with the only goal against Slovenia. What he said: "At some stage, I want to be the best player in the world." Sports Personality record: First nomination. The last footballer to win was Ryan Giggs in 2009. Continued her remarkable rise by becoming the first British woman to reach the Wimbledon singles semi-finals since Virginia Wade in 1978. She lost out to five-time champion Venus Williams, but rose to number four in the world rankings, having been 150th at the start of 2015. Konta, who was born in Australia and moved to England as a teenager, took the Miami Open title with victory over Caroline Wozniacki in April. What she said: "I'm constantly looking to be more mentally strong and technically sound. I'm trying to leave no stone unturned." Sports Personality record: First nomination. British men's number one Andy Murray has won the award three times in the last four years but is not shortlisted after an injury-hit year. Overcame serious cramp in the warm-up to take victory at the World Para-athletics Championships in London. Sports Personality record: First nomination. No Paralympian has won the main award, though wheelchair racer Tanni Grey-Thompson was third in 2000. Won two world titles and broke his own world record twice in one day at the World Aquatic Championships in Hungary in July. The Olympic champion retained his 50m and 100m breaststroke titles in Budapest. Boasting the 10 fastest times in history in the 100m breaststroke, the Staffordshire swimmer beat his own 50m world record once in the world heats and again in the semi-final - clocking 25.95 seconds to become the first person to break 26 seconds. What he said: "I honestly can't believe it. I can't even think. I just went out there and did what I do." Sports Personality record: 11th, 2016; 11th, 2015; 10th, 2014. Two swimmers have been BBC Sports Personality of the Year - Ian Black (1958) and Anita Lonsbrough (1962). Rebecca Adlington was third in 2008. Became the first rider to clinch three successive World Superbike titles, triumphing with five of the season's 26 races remaining. What he said: "This is a dream. This is my time and I have to savour the moment." Sports Personality record: First nomination. The last motorcyclist to be nominated was James Toseland, who finished fourth in 2007. Named player of the match as England secured a dramatic victory over India to win the Women's Cricket World Cup. in July. The Somerset bowler took five wickets in 19 balls as she claimed 6-46, the best bowling figures in a World Cup final. Shrubsole became the first female cricketer to receive the Christopher Martin-Jenkins Spirit of Cricket award for consoling distraught South Africa captain Dane van Niekerk after the semi-final victory before celebrating with her team-mates. What she said: "You never actually think these things are going to happen. For that dream to be a reality is just amazing." Sports Personality record: First nomination. Andrew Flintoff was the last cricketer to be voted Sports Personality in 2005. Secured her fourth successive global title by claiming heavyweight gold at the World Championships in June. Walkden became the first British taekwondo fighter to win back-to-back world gold medals when defending her title in South Korea and went on to claim Grand Prix victories in London, Moscow and Morocco. The Liverpool-born fighter has lost only once since claiming bronze at the 2016 Olympics, when she was unlucky to miss out on the gold-medal match, having lost in a golden-point round. What she said: "I have the confidence that I'm becoming one of the best and no matter what happens I don't want to give up."